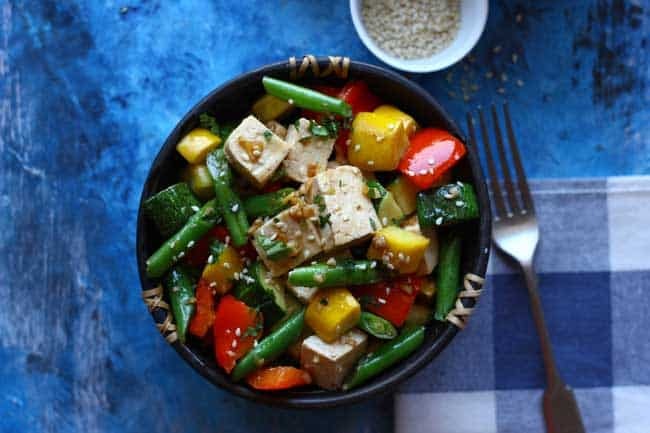 Tofu and Vegetable Stir Fry is packed with the health and goodness of colourful, seasonal vegetables – broccoli, beans, bell pepper, and squashes. You can pick any combination of local produce of vegetables for this gluten-free, vegan stir-fry. It is a low-calorie one-pot meal. Perfect even for a diabetic diet. 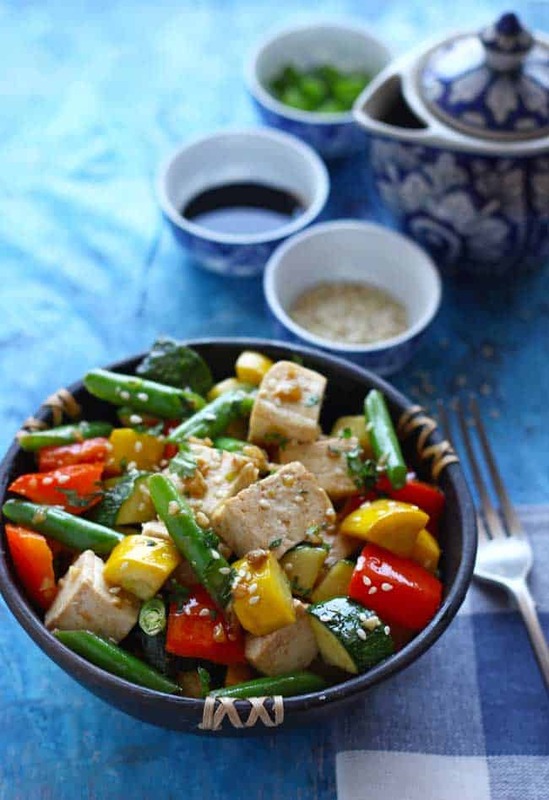 This Tofu and Vegetable Stir Fry is currently a hit on our weeknight dinner menu. There are two reasons for that. One, it takes less than 30 minutes to get ready. Second, it tastes super delicious. You can serve it with fried rice as well. Or maybe with Pad Thai Noodles. It’s no secret on here that I love a good stir-fry. And it is repeated on our weekly menu maybe twice or thrice. At times I pack it for his office lunchbox as well. Stir fries are without a doubt my favourite go-to meal when I need to whip up something quick in the category of comfort food. They’re quick, healthy and delicious. And probably the best way to consume tons of fresh vegetables. Very rarely I follow a set recipe to make everyday stir-fry. 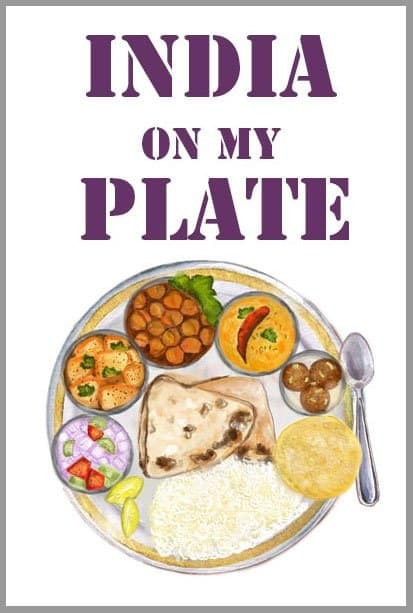 I just round up whatever random vegetables I have in the fridge, maybe add protein – paneer/tofu/chicken/fish, add few sauces to taste that sounds good, and a satisfying stir-fry is usually sizzling in the skillet and ready to eat in just 15 or 20 minutes. But in a good stir-fry sauce and seasoning should never over powder the persona of fresh vegetables and protein. The crunch of vegetables in every bite is the soul of a good stir-fry. Overloading it with sauces make it not so healthy and a tad too boring. Try to flavour it with aromatics like – garlic, ginger, chillies, lemon, spring onion or cilantro. If you give this recipe a try, leave a comment below or take a picture of the stir-fry and tag it #funfoodandfrolic on Instagram! I love seeing what you come up with! 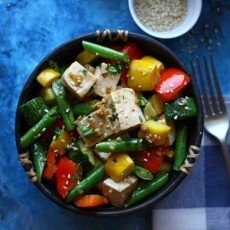 Tofu and Vegetable Stir Fry is packed with the health and goodness of colourful, seasonal vegetables. 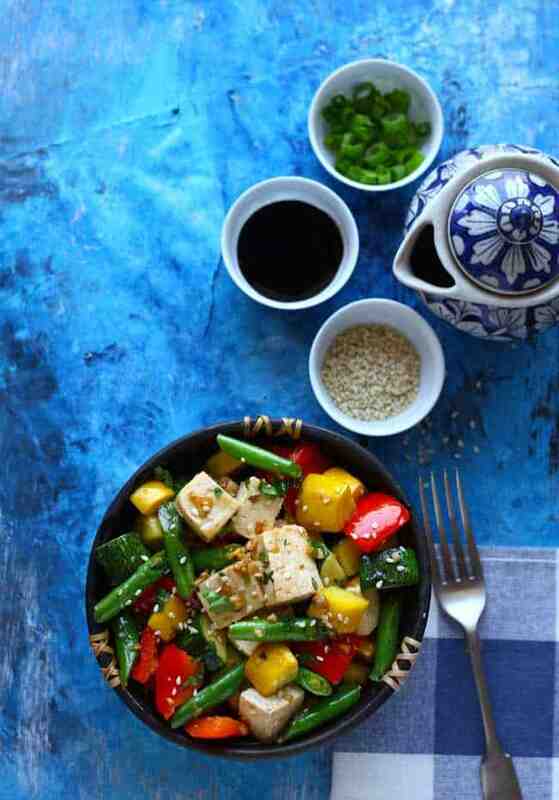 Learn how to make quick tofu and vegetable stir-fry. To a large pan over medium-high heat, add olive oil and swirl to coat. Add ginger, garlic, and red chili. Stir-fry till aromatic and garlic turns light brown in color. Add the tofu cubes and cook for 1 – 2 minute on each side. Transfer to a plate and set aside. Then add veggies one by one and stir-fry on high heat. Cook for 5 -7 minutes, stirring the skillet. When the vegetables have some color and have softened a bit, add the soy sauce, salt, pepper and stir. Then add the tofu and stir to coat. Cook the mixture for 3 – 5 minutes, stirring the work and not using a spoon. When veggies are cooked to your preferred doneness, remove from heat. Drizzle honey, mix gently and sprinkle sesame seeds before serving. If you prefer, add spring onion greens as well. Tofu and Vegetable Stir Fry taste best when eaten fresh. Lovely recipe. Since I’ve been eating healthy for over a month now, this recipe is apt. Thanks. I am so thrilled that you liked it. Stay tuned with us for more such recipes.